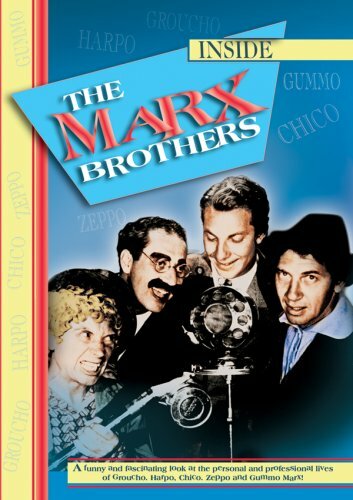 INSIDE THE MARX BROTHERS is a funny and fascinating look at the personal and professional lives of Groucho, Harpo, Chico, Zeppo, and Gummo Marx, featuring classic clips from such Marx Brothers favorites as "Animal Crackers," "Monkey Business," "Duck Soup," "A Night at the Opera," and "A Day at the Races." Also included are rare newsreels, TV clips, home movies, and interviews with Groucho, Chico, Groucho’s son, Arthur, and "Room Service" co-star, Ann Miller. Rarer still are scenes from Harpo’s 1925 silent film, "Too Many Kisses" and, at long last, an actual sound clip of Harpo’s voice! Whether you’ve just discovered these delightful comics or you’re a lifelong fan, you’ll love INSIDE THE MARX BROTHERS. As a special bonus, you’ll also get the Four Marx Brothers in the rare, complete, uncut sequence from the 1931 Paramount promotional film "The House That Shadows Built," and the complete "Person to Person" interview between Groucho and Edward R. Murrow from 1954!